I often get questioned by friends and readers about what they should pack to Munich in a specific month. Well, this is always a tricky question, because Munich is one of those places where in one day you can have the four seasons of the year. Sometimes early in the morning is 6°C and in the middle of the day is around 20°C. I have seen sun, rain, windstorm and snow on the same day. So, answering to that question is never easy, it always involve a long explanation. 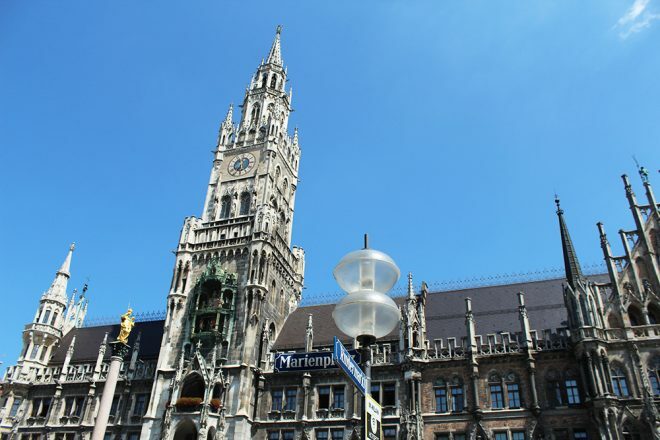 But since I’m not the kind of person who gives up easily on something, I put some extra work, did my research, added a little bit of experience, and came up with a list that might be very helpful to all of you when packing to Munich in every month of the year, plus extra useful information regarding the weather. 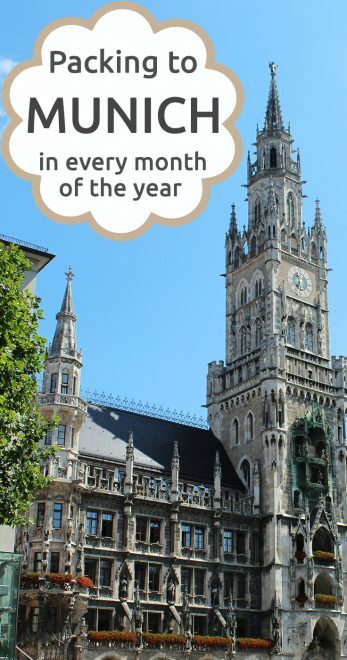 To make your navigation throughout the post easier, you can jump straight to the month you are planning to visit Munich. You may find similar items for different months, especially winter and summer. Remember, these are just the must packs, clothing items that will make a difference on your trip. April is the most challenging month to pack to Munich, as you may experience the four seasons in one day (really). In Germany we say “April macht was er will”, which means ‘April does what it wants’. The weather forecast can change at any time. Note that in both June and July, the weather can be chilly, so make sure to check the weather forecast. Tip: since on the last weekend of September the Oktoberfest begins, you can check my packing for the Oktoberfest recommendations. December, January and February are the coldest months. Take into consideration that some years snows more/less than others. Always check the weather forecast before closing your suitcase, ALWAYS! I think every time I have ever been to Munich it hasn’t been the best weather! Only once or twice we had clear blue skies and this is why I still haven’t been to the English Garden! I know right? I hate that :/ good weather here is something to be cherished because it doesn’t happen so often. We get 2 great days, then the rain comes for an entire week. It’s always like that! I’ve only been to Munich once, in a heatwave! You do get some extreme temperatures there, this is a useful post for those not too sure what to take. Yes Phoebe, very true… here can be very hot! Last year was incredibly hot during summer! Thank you so much Gina, happy that you liked it! hahaha exactly 😀 thank you so much! Thank you dear, happy that you found the post useful! Yes, the weather here is very tricky, even for us who live here. The day starts great then out of nowhere it’s pouring! hahahaha 😀 thank you Ruth! I hope it will be useful to you someday! I hope you visit Munich sometime 😀 and I hope the weather will be great! I hope you do come Lauren! Ohh nooo, I can imagine… April and May are always crazy month in the whole Germany I guess! Oh really?? I am a huge fan of thermals, they are amazing! I know what you mean about the ‘cold’ of Thailand, in Brazil it’s the same! wooww that’s amazing!!! I’ve never been to the Neuschwanstein when it was full of snow!! It’s been a while since the last snow storm in December, I think the last one was in 2012. The past years have beeb warmer than expected! Thank you dear 😀 I hope it will be useful to you someday! Yess, it can be very cold around here! Thank you so much Kayleigh, happy to know that you like it 😀 I hope it will be helpful to you someday! By the way, I couldnt visit your website these days, is there a problem with your blog? My computer blocked me saying it was security issue :/ what should I do? My website is no longer hosted in WP, the address is now http://www.katpegimana.com. Can you please try again? Let me know if the problem persists. Thanks! Heey Neha, I guess I’m too late! I hope you had fun in Munich. These past weeks were very busy around here, so I’m sorry for not replying to your comment earlier!